← Dr. Kirsten Swinth discusses her New Book on December 3rd! Fordham students take pride that “New York is [our] campus.” The university’s locations offer access to unique lectures, exhibits, and other educational opportunities. Yet the advantages of New York City sometimes make us forget those available right on campus, especially at Walsh Library. Indeed, I found during my first semester teaching that many undergraduates did not know how to put a book on hold, search the library’s various databases, or use Interlibrary Loan. Consequently, I made it a priority during my second semester of teaching to incorporate the library into my lesson plans as much as possible. My Understanding Historical Change: Medieval Europe course learned about the library’s electronic resources through an instructional session with Reference and Instructional Services Librarian Peter Patten and Reference and Assessment Librarian Jeannie Hoag. The University’s Curator of Art, Dr. Jennifer Udell, deepened my class’s knowledge of the Roman Empire with a tour of Fordham’s Museum of Greek, Etruscan, and Roman Art. I also wanted my students to visit the library’s Rare Book Room to see actual medieval documents. At the end of my first semester at Fordham, I remember talking with fellow graduate student Alisa Beer, who emphasized the importance of touch in learning. In her experience, students’ enthusiasm and understanding dramatically increased when they could handle documents, instead of just reading them in translated editions. I learned this lesson firsthand in Dr. Magda Teter’s European Nationalisms and Early Modern Jewish History course. Dr. Teter held a class in Walsh’s Rare Book Room and showed several books and manuscripts, many in Hebrew. I had never studied the language before, so I was amazed at how much information could be gleaned from just a book’s physical format and illustrations. I probably remember more about Simon of Trent, the main subject of that class, than most other topics in the course thanks to the Rare Book Room. Following in the footsteps of Dr. Teter and Alisa, I organized a class last spring in the Rare Book Room. 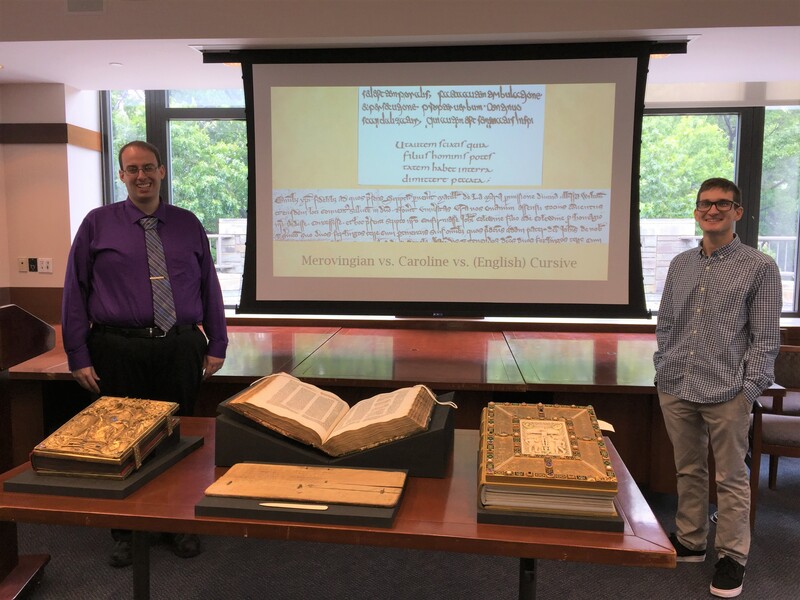 Kevin Vogelaar, a good friend, former MA student in Medieval Studies, and the Archives Graduate Assistant that semester, helped me prepare and teach the course. I chose medieval monasticism as the broad topic of the class, since monks were the major document producers until the later Middle Ages. 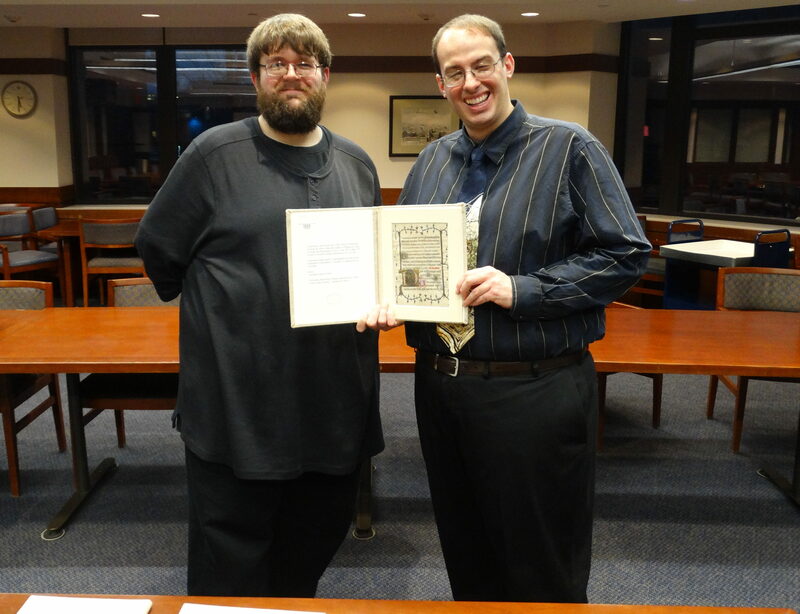 Keven and I presented antiphons, Books of Hours, psalters, and other documents related to medieval spiritual life. I felt very fortunate to have Keven helping me. He had a good grasp not only of diplomatics and paleography but also medieval music, a subject I knew woefully little about and the students were very interested in learning. I received such good feedback from the students about that class that I decided to have two classes in the Rare Book Room this semester. 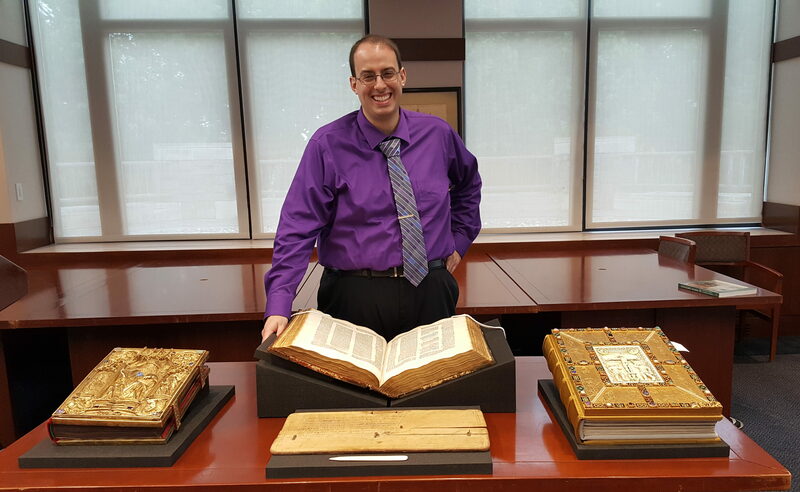 Again, I was lucky to have a good friend, Medieval Studies MA student David Howes, working in the archives this semester. I emailed David during the summer simply to schedule the classes, but before I knew it, he was showing me documents that I did not even know Walsh owned. We taught students about the expansion of government and education in the later Middle Ages (1000-1350) by showing them beautiful facsimiles of the Bayeux Tapestry, Magna Carta, and Gutenberg Bible as well as actual manuscripts of deeds, writs, and chirographs (contracts). Again, I enjoyed watching the students’ excitement as they “touched” history, and I was also happy to see David’s confidence grow as an instructor. Never having taught before, David went from having a deer-in-the-headlights look at the beginning of the first class to calming asserting, “I can do this,” by the end of the second. However, my favorite part of the class was finding an indulgence written by William of Adam, a bishop very active in the late crusade movement and important to my personal research. Like so many other texts in the university’s archives, few scholars know about it. The library has so many opportunities for teaching and research that Fordham students must not forget: New York is our campus, but Walsh is our library!